You will get help from this book. If you or someone you know want help struggling with alcohol or other drug problems this book will help. You could learn how to use the strengths and resources you already have to overcome personal challenges. You can learn at your own pace. Be sure to practice the interventions that you will find so helpful. 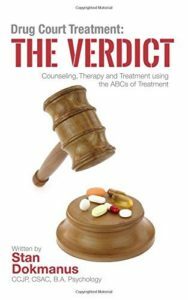 My book is not only for drug court clients. You may be a professional: a doctor, attorney, business executive or in the military. Addiction does not respect education, income or profession. It will take over (addictio) anyone who gives alcohol or drugs a chance. That’s why this book, a great gift to yourself or for someone you care about, is so important. Telephone Interventions can be arranged for privacy and to avoid having your superiors learn about your concerns. This can be of real concern in the military. http://www.washington.edu/news/2016/11/07/telephone-based-intervention-shows-promise-in-combating-alcohol-abuse-among-soldiers/. You may already be in the criminal justice system (on paper) in drug court, on probation or parole. You probably already have enough ‘whys’ to change. This book will give you the ‘hows’ to change. If you, your loved one or your group (family, work or agency) need help – contact me now by email – standokmanus1@outlook.com – and we will arrange an appointment or discussion. You can buy it now by clicking the Amazon link. Thank you.